I'm happy that it's becoming a nice "nabe" or hot pot season. 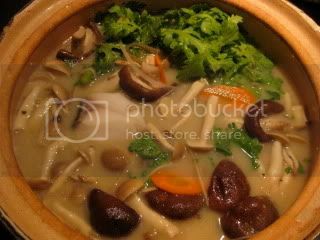 With my classic-style donabe, "Hakeme", I made "Sake-kasu nabe". 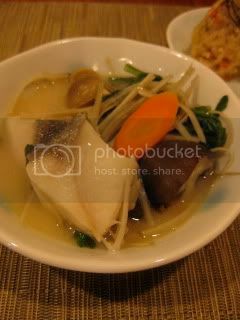 The broth contains the significant amount of "sake-kasu" or sake lees, which is a leftover from sake making. If available, I prefer buying the "Ginjo sake kasu" (soft paste sake lees), instead of "ita kasu" (hard paste). While the hard paste sake lees is normally from mass-produced cheap sake, Ginjo "soft paste" sake lees is indeed the leftover from Ginjo sake production. Ginjo sake kasu is much more aromatic (yes, it does smell like ginjo sake) and flavorful. Here's the recipe for the broth: Combine 1 quart dashi stock, 3 tablespoons white miso, 1/4 cup sake, 4-5 tablespoons sake-kasu, and 1 tablespoon usukuchi shoyu (light color soy sauce). 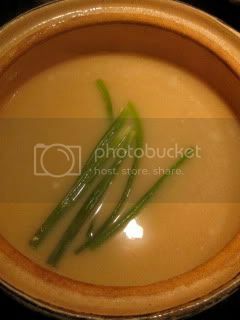 *Before adding to the stock, in a separate bowl, combine the miso, sake-kasu, soy sauce and sake and whisk together, so that it will be easier to dissolve. Green onion was infused and discarded. 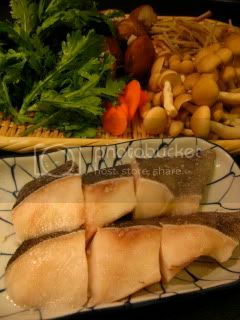 The ingredients to put in the broth were gindara (black cod), gobo (burdock root), shimeji mushrooms, carrot, shiitake mushrooms, and shungiku (chrysanthemum greens). Very rustic style. 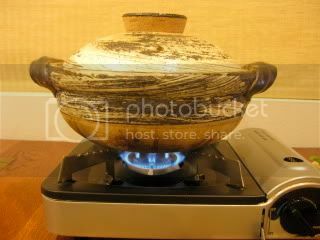 Everything was brought to the table and cooked over the table-top gas burner. The dish was served with different condiments, such as shichimi peppers, scallion, and grated daikon. My body was so happily satisfied. The broth was so sake-yee and beautiful.